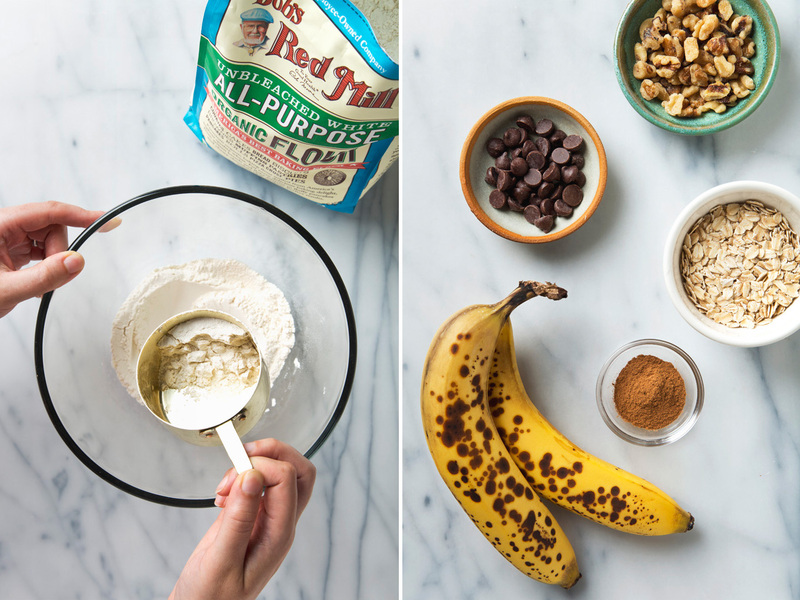 Soft-Baked Banana Bread Cookies—9 Ingredients! Happy cookie season! Most of the year, Aaron and I actually try not to keep cookies at our house because neither of us has very good self-control when it comes to enjoying them responsibly (as in, not eating the entire batch in two days or less!). But in November and December? We make an exception and I go to town baking several treats a week “for the blog,” and we both get to eat cookies to our hearts’ content. These soft-baked banana bread cookies have quickly become one of our latest favorite indulgences, and good news! The ingredients are wholesome enough that you don’t need to feel guilty if you eat them for breakfast. 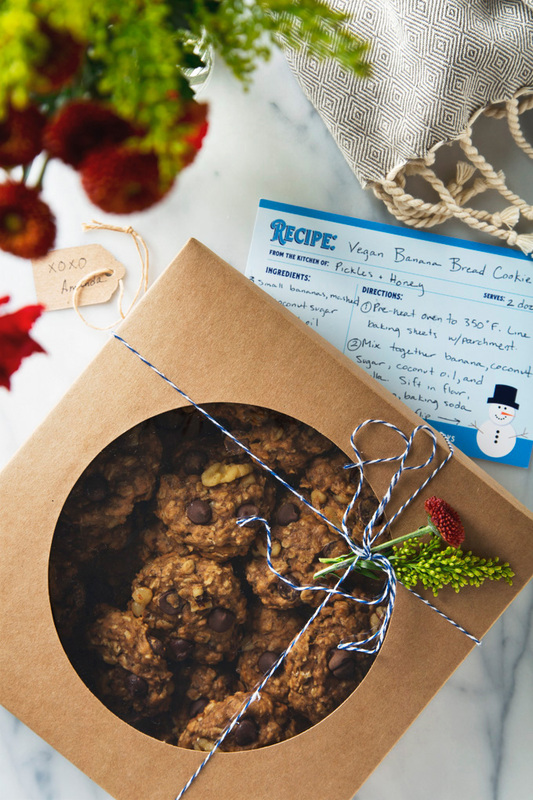 Much as we would love to keep all of the cookies to ourselves, this batch was destined as a housewarming gift for our friends who just bought their first place. I was originally going to bake up a loaf of my vegan banana bread, but I couldn’t shake the idea of doing a soft-baked banana bread cookie with a muffin-like center. 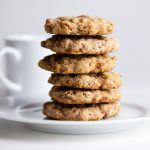 These banana bread cookies are vegan with a gluten-free option, and just 9 simple ingredients. The base is a mix of rolled oats and my favorite Organic Unbleached White All-Purpose Flour from Bob’s Red Mill. Their flour is my go-to for baking because it’s high quality and reliably yields a great taste and texture in baked goods. From there, I added a few extra ripe mashed bananas, a little coconut sugar (the bananas do most of the heavy lifting in terms of sweetness), some coconut oil, vanilla, and cinnamon. You could stop there, but I personally recommend adding the optional walnuts and chocolate chips for some extra texture. Plus, who doesn’t like a melty chocolate chip cookie warm out of the oven? 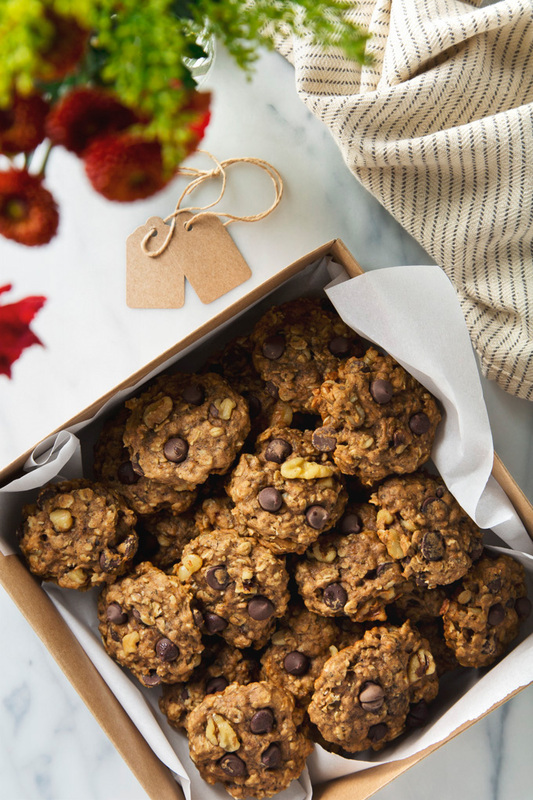 These vegan banana bread cookies are a fun twist on your favorite banana bread! They're soft and muffin-like in the center, with the option for classic add-ins like chocolate chips and walnuts. 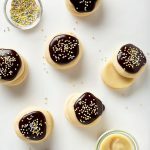 Just 9 simple ingredients and 20 minutes to make! Preheat the oven to 350°F. Line two large baking sheets with parchment paper. Using a stand or hand mixer, mix together the banana, coconut sugar, melted coconut oil, and vanilla. Sift in the flour, cinnamon, baking soda, and salt. Add the rolled oats and mix until well-incorporated. Fold in the chocolate chips and walnuts, if using. Scoop the dough onto your cookie sheets, 2 inches apart, using a heaping tablespoon or cookie dough scoop. Lightly flatten the dough with a spatula. Bake for 10-12 minutes, or until the edges are golden brown. Allow the cookies to cool slightly before enjoying. Make sure you mash the bananas until very few lumps remain. 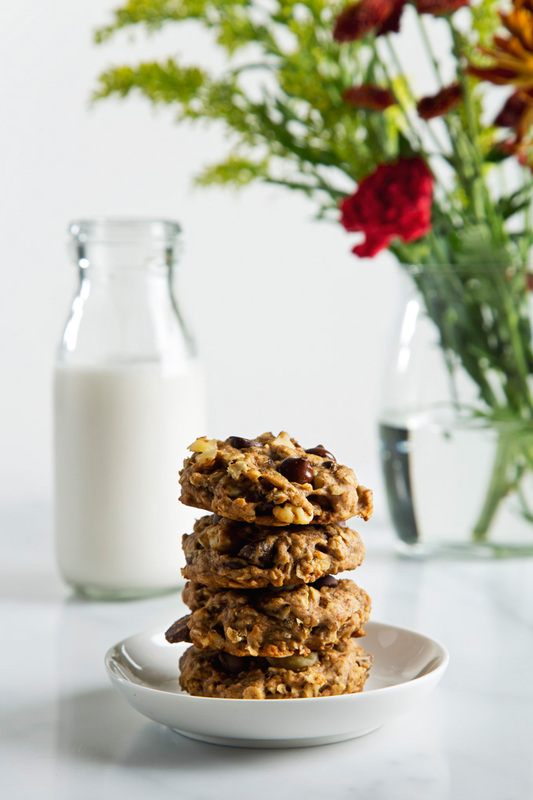 These cookies are also great straight out of the fridge for a firmer, extra chewy cookie. To make this recipe gluten-free, you can replace the all-purpose flour with Bob's Red Mill Gluten Free 1-to-1 Baking Flour. Make sure to also use certified gluten-free rolled oats. Thank you to Bob’s Red Mill for sponsoring this post. 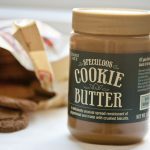 Check out BobsRedMill.com to get a coupon for $1 off any product! Oh I absolutely cannot wait to make these cookies! Soft baked are my favorite kind! I made your cookies as soon as I got your email update in my inbox. I added chocolate chunks, walnuts and raisins and they turned out perfect. This was a very easy recipe and one I’ll be making again and again. Oh, I bet the raisins were a really good addition! 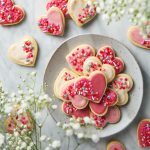 These look like the perfect breakfast cookies! Can never go wrong with bananas and chocolate chips! These were great! Husband loved them. And so easy to make. Wow, what a compliment! Thank you, Catherine (and Catherine’s sister 😉 )! Will this work with granulated sugar too? Can’t wait to try out this recipe!